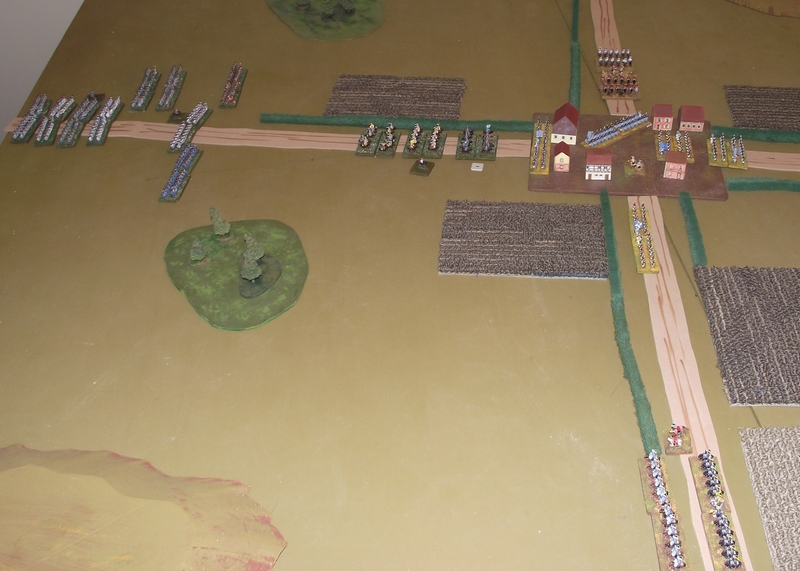 The French force moves first and is scheduled to arrive half on turn 1 and the remainder on turn 2. The Allied advance guard consists of Bavarian infantry (yes, the perfidious Bavarians are back in the Holy Roman Empire) and assorted Allied cavalry. Allied reinforcements are scheduled to arrive in random order starting on turn 3. 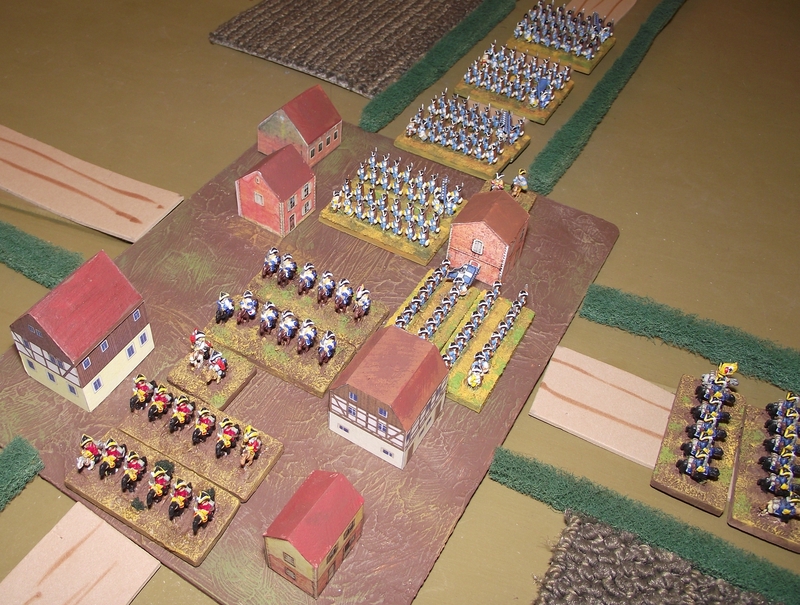 Poor command rolls plague both sides in the early turns, but the Bavarian infantry is able to deploy defensively in the village and the flanking hedge-lined roads. After turn 1, the right flank Allied cavalry refuses to move for several turns. Road congestion and an Allied command blunder delay arrival of reinforcements. 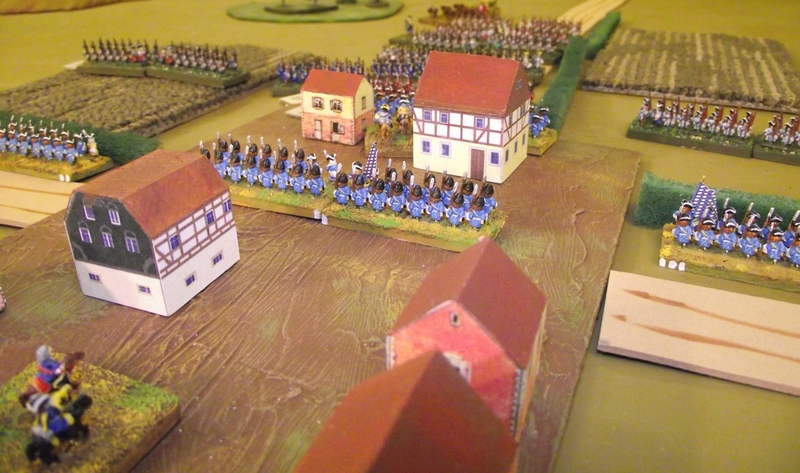 French cavalry boldly approaches the village, but volleys from Bavarian infantry (and the rule that cavalry cannot charge into buildings) sends them to the right. Still in march column, they are harassed by infantry fire and a regiment breaks. The left flank Allied cavalry attempts to charge the French cavalry column, but fails to reach it. The French then deploy and charge, destroying both Allied regiments. The victorious French cavalry regiment is broken by Bavarian infantry fire. In the space of a few turns, four cavalry regiments, two on each side, have been broken by low rolls on the break table. The remaining cavalry regiment charges through the plowed fields in an effort to roll up the infantry defense. The Bavarians hold and the cavalry retires shaken. 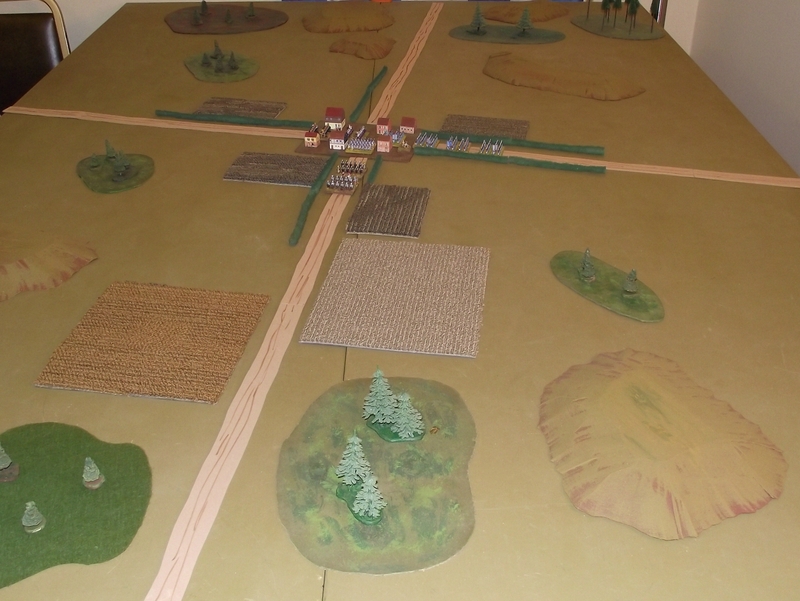 On the French left, an infantry brigade deploys in an open space to block any Allied cavalry advance. A reinforcing Allied cavalry brigade arrives and (apparently) gives the original right flank brigade the courage to advance also. With the other choice being a long detour, the Allied cavalry charges the French infantry frontally. The French lose an infantry brigade and two Allied cavalry regiments are left shaken and disordered. The other Allied cavalry refuse to charge. Continuing French infantry fire keeps some Allied cavalry disordered and unable to clear the field. In the village, French infantry enter through an unguarded corner. A battle of attrition begins with the ignominious performance of a Bavarian grenadier battalion (another very low break test roll). With several battalions on each side waiting to enter the village, stalemate is likely. Allied reinforcements stream on the field. Threatened with overwhelming force, the French decide that they have done all that honor requires. 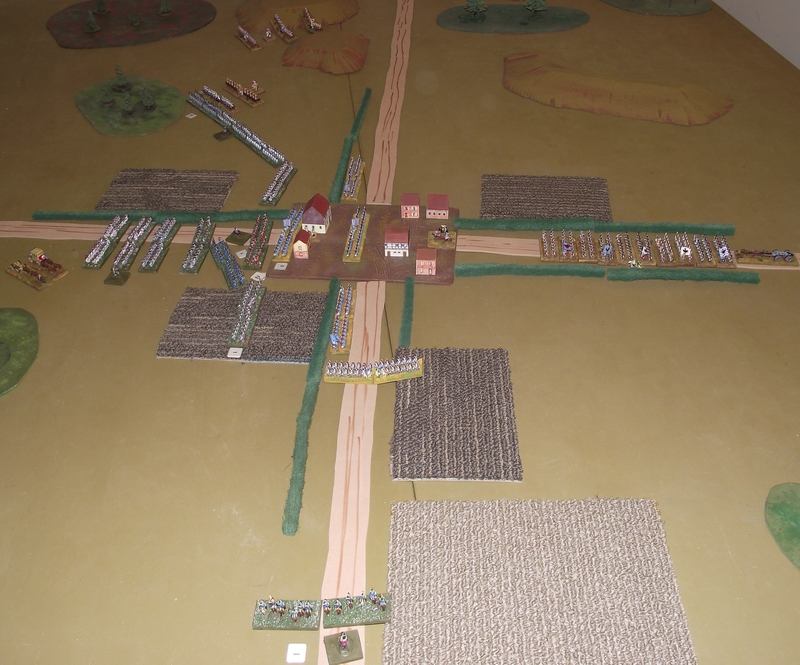 This entry was posted on May 2, 2011 at 4:19 pm and is filed under 18th Century, 6mm Miniatures, Black Powder, Miniature Wargames. You can follow any responses to this entry through the RSS 2.0 feed. You can leave a response, or trackback from your own site.